Violin made by Christian K. Thoen in 1892 in Norfolk, MN. It has mother of pearl inlay and rosemaling done in ink on the trim. Christian was born July 11, 1844 in Halingdahl, Norway. He emigrated to America in 1866 with his wife Bergit Olesdatter Teigen. 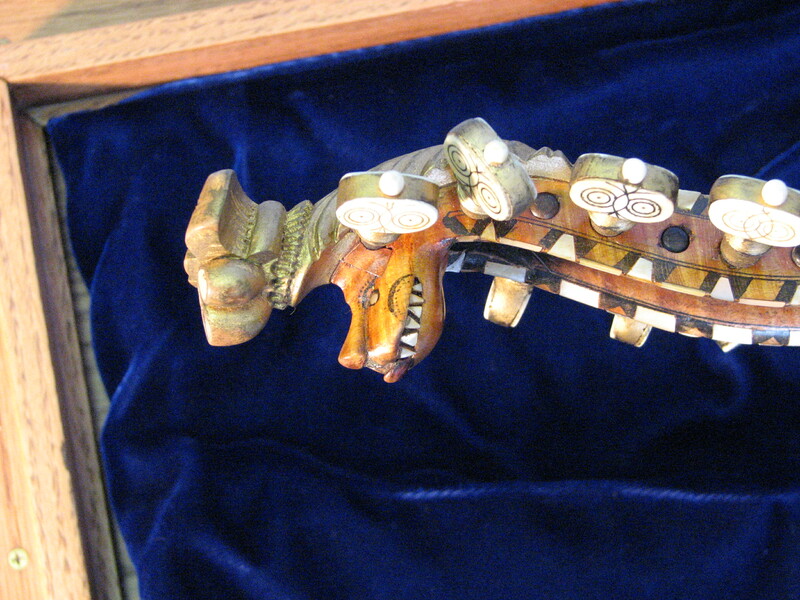 They came to Stearns County, Minnesota and settled in Pine Creek where in 1902, he made this violin. Christian died there in 1903. The violin was given to his son Olof who played it for many weddings and festivals. Olof’s daughter Lavern Thoen Johnson played the violin and Olof’s grandson Stephen Keller had the instrument repaired and also played it. It has its own display case and is in good condition. Hardanger fiddles / violins have a second set of strings that run underneath the strings that are actually played. They vibrate in sympathy with the played strings and create a unique and pleasing sound. They are often ornately decorated, much like the one in our collection. 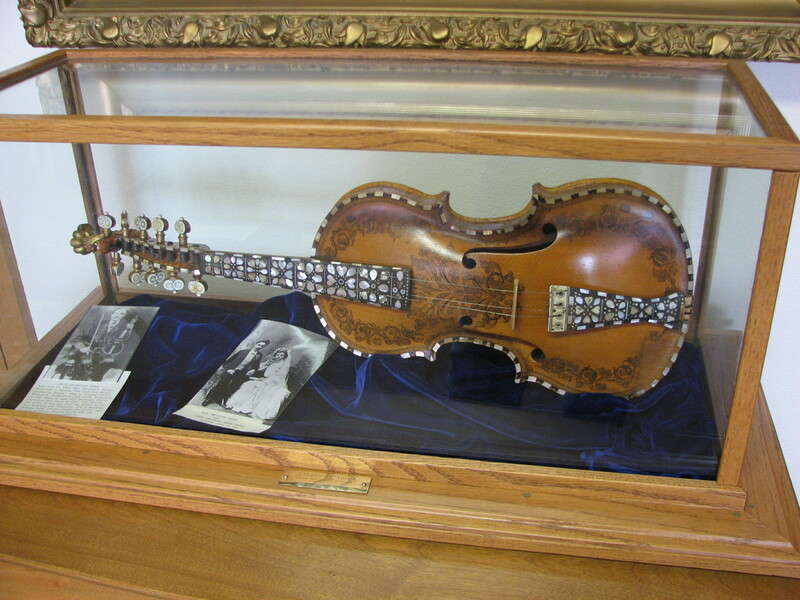 This entry was posted in Collection Notes and tagged halingdahl, hardanger, Immigrant, norway, Pope County Minnesota, Pope County Museum, violin. Bookmark the permalink. Very nice article. Christian was my GG Uncle. I am descended through his brother, Anders (Andrew) Thoen. They were also the sons of one of Norway’s premiere Hardanger fiddlers, Knud Chistenson Thoen. There is a story that Christian brought Knud’s Hardanger fiddle with him from Norway when he immigrated. Is there any record of it’s current location that you know of? Unfortunately, I don’t know of any records regarding Knud’s fiddle. We do have other Thoen pieces here in our collection. There is a baby cradle made by Olaf Christan Thoen and a quilt & pillowcase made by Christine Dunham Thoen. Hopefully you can come and visit us someday. Christian K Thoen is my great grandfather, Olof Christian Thoen, my grandfather and LaVern is my mother. I remember the violin and it’s nice to see it featured as a collection highlight. That cradle you mentioned was beutifully made of cherry wood. I think grandpa Olof made it for either me or my cousin, Kenneth. in the early 1940’s. I am still using two quilts that my grandmother Christine made. The cradle is indeed a beautiful cherry wood work of art! Do you have any photos of it in use in your home? It would be wonderful to add photos to our collection. Superb! Generally I never read whole articles even so the way you wrote this post is simply amazing and this kept my affinity for reading and I enjoyed it. You’ve got great way with words-at all. Thanks for the encouragement! I hope to do more articles on artifacts soon.